Well here I am saying I don’t follow any particular religion, yet I keep posting images of churches. I love their architectural design though and am also experimenting with iPhone (iphoneography). Anyway this little church is in my town and has a very similar design to the Twilight Church photo I took on Sat. Same dome, window and little railing. They are both churches of “first church of Christ scientist” So not sure if that design is required or not – perhaps someone can tell me. Again, shows benefit of taking photos and noticing the details. I like the shadows of branches too on front of church. Anyway used an HDR app on my iphone, snapseed to edit and added a grungy filter and frame. Very nice. Old churches are very appealing to me. I got married in one on a hot August day with no air conditioning. Ha! Thanks Gina. Ouch at least you didn’t have to wear a tie! I am not a religious person but I do love churches lol! Thank you so much for the info you share about the iPhone and apps I am just learning. Your photo is amazing as good as any in a publication. You just need that break! I had to pin this to my Country Church board. 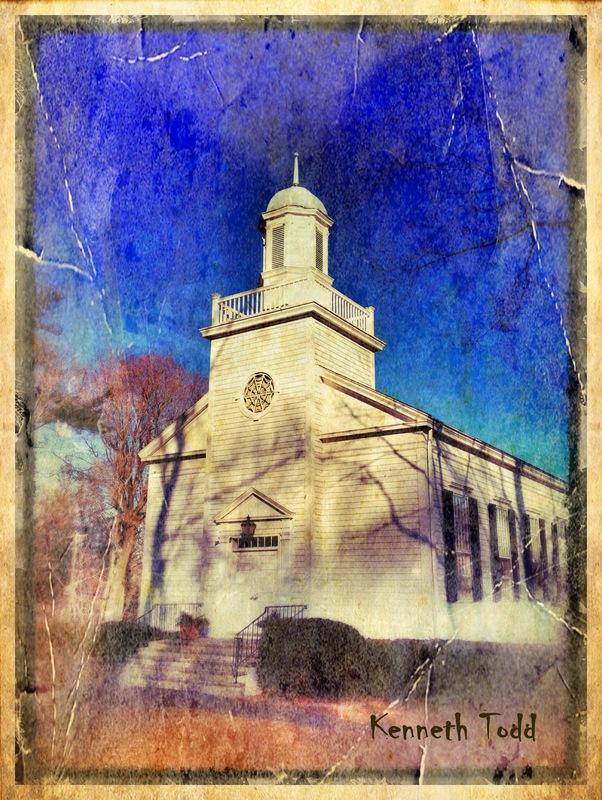 I love the old churches. Old churches are lovely, yes indeed. I love especially old wooden churches. I have photographed about 380 churches in Finland around my country. Nearly all of them on countryside; only few in cities and towns. Photos, few only, You can find from my blog under Categories. I wish all the best to You with this special hobby. Thnaks for that. I really enjoyed looking at your blog too. So much stuff though, I will have to keep returning. Somehow, I also like churches too, and your photo. Have you seen the photos of this man? I love this picture–very serene. Thanks for visiting my blog. I’m not good at photography, but I sure do enjoy seeing other peoples well made pictures. My dad was a professional in photography. Always great to find a fellow 365 blogger. I know exactly what you mean about the joy of doing something you love – every single day. Great stuff. Keep it up. See you December 31st. I love the rustic feel of this photo. Did your filter create that affect? Yes. I used a grunge filter to add texture and aged look.